Cat Ba, a fascinating island in the footsteps of the world’s most beautiful bay: Halong Bay. It is also the most diverse destination in Vietnam. A tropical island with green forests, idyllic beaches, breathtaking views and a stirring history that translates into fascinating cave constructions and an intriguing fort. 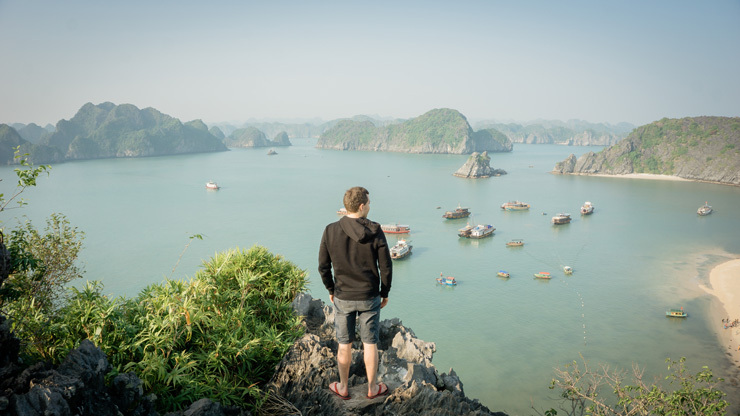 Every backpacker knows Halong Bay. Rightly so, but it also has its disadvantages. Not only the many tourists, but also the many rubbish floating around obstruct the overwhelming views. Less known is Lan Ha Bay. Yet it has the same fascinating landscape. Countless steep limestone rocks rise from the sea and split the horizon in a sublime way. 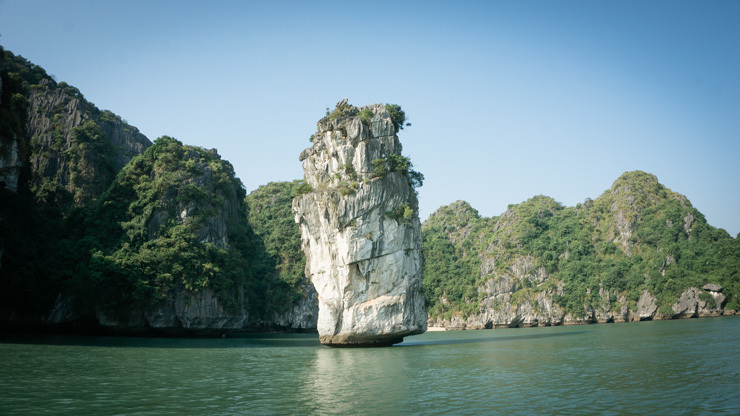 It’s a unique experience to sail and especially to kayak around, between and even beneath – through caves – these impressive rocks. It seems like you enter the setting of an expensive Hollywood movie and you’re part of this fairytale story. 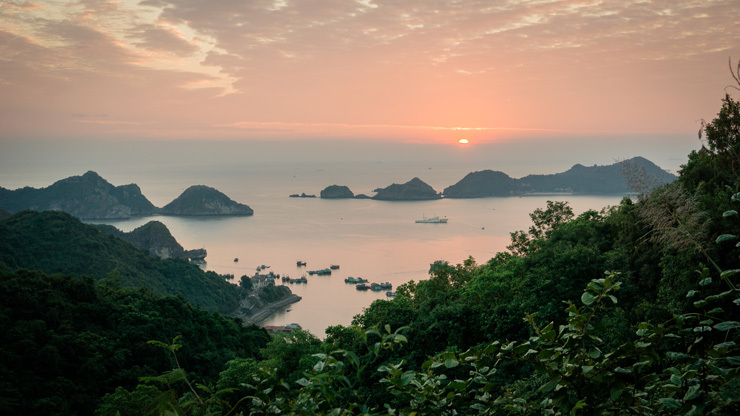 In Lan Ha Bay you hardly have to share the unbelievable beauty with others. Suddenly you realize that this is just real life… Speechless! 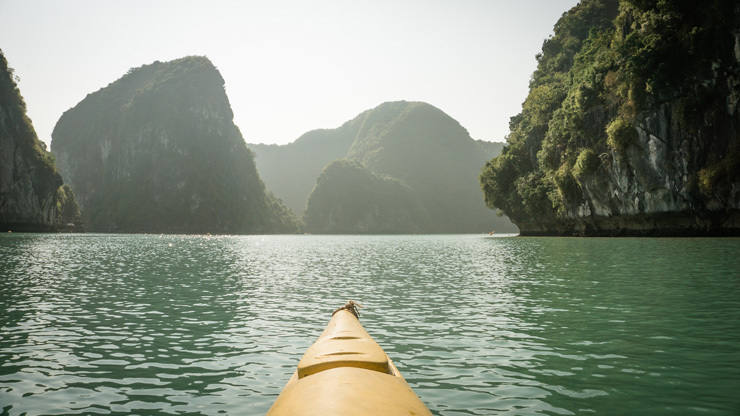 A day trip, including lunch and kayak, will cost you only $12 per person. Indeed, you read correctly: twelve dollars for a full day. Do you like an adventurous hike? Make sure you choose a trip that provides sufficient time on Monkey Island. You can climb (say clamber) to the top of the island and reward yourself with a fantastic 360° view over the countless islands in the bay. Wear proper shoes for this one. We unfortunately forgot to take them with us on the trip and climbed on flip-flops: not a good idea! It is a short but steep climb and the rocks can be quite sharp. 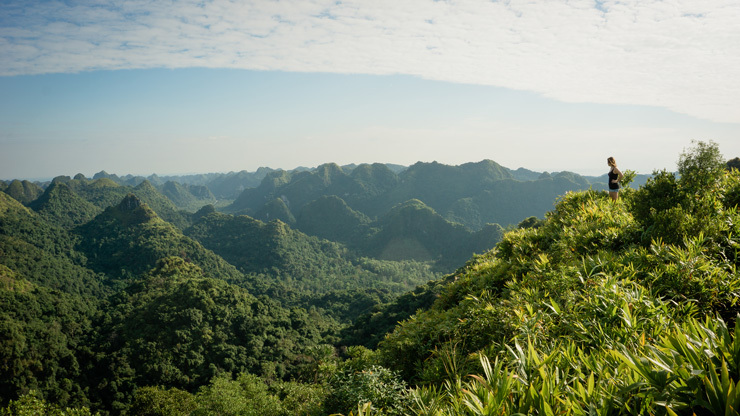 Don’t miss a visit to the National Park during your trip to Cat Ba! Cat Ba Island basically is an outsized version of the forested limestone rocks that in countless numbers emerge from the sea. That is why the island has such a fascinating landscape. There are several hiking trails through this deep green area but there is one you certainly can not skip: the trail to the summit of the island. Expect an insane view. You surpass the entire island’s tree line and get a bird’s-eye view over the green waves of this forest. And then it’s time for something completely different. This diversity is what makes Cat Ba so nice! Near the center of Cat Ba Town you will find Cannon Fort. 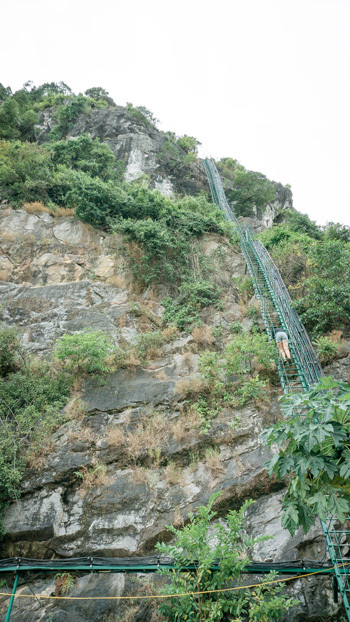 The French built this fort on a 580 feet high peak to protect the industrial center Hai Phong during the Vietnam War. You will get a good impression of the gruesome battle in this otherwise scenic area. Bunkers, cannons and tunnels are just a few examples. Not only for its intriguing history Cannon Fort is worth a visit. The panoramic views are also breathtaking. Do not miss sunset over there! Another fascinating remnant of the Vietnam War is Hospital Cave. Invisible from the road and air, Hospital Cave was of great strategic importance. As the name suggests, the cave was used as a hospital for the victims of the war with the Americans. In addition, this three-story high cave was also a great safe house for the Vietcong leaders. 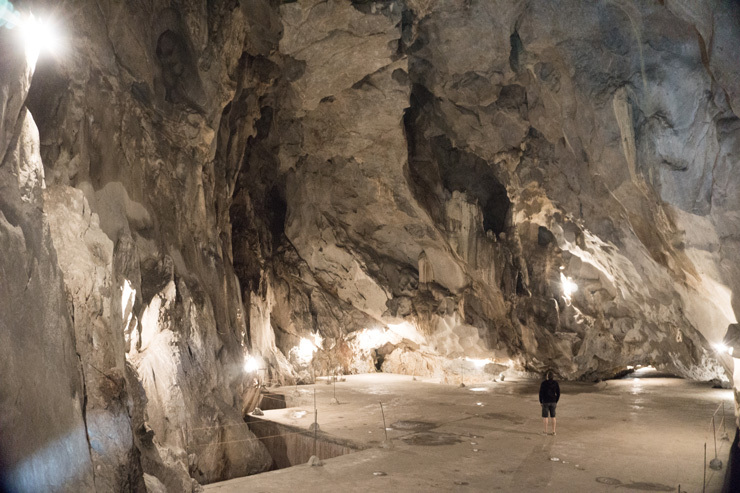 The Vietnamese are known as excellent cave builders and this is a very impressive example of this. Hospital Cave is on the same road as Cat Ba National Park, making it perfect to combine. We would like to end with an insider tip. 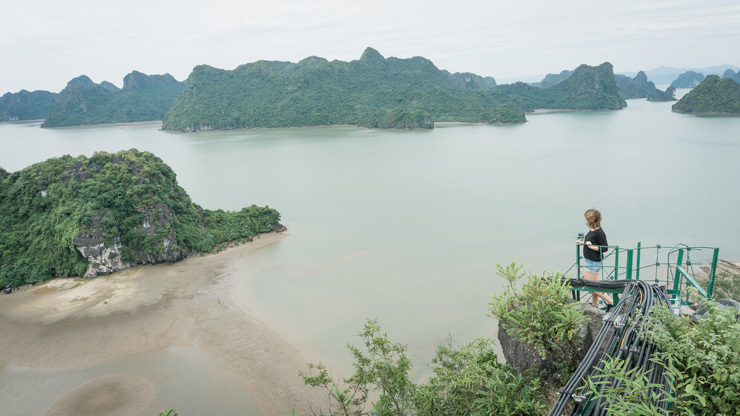 In the north of the island you will find a unique viewpoint over Ha Long Bay. Unlike the other viewpoints on Cat Ba, this one is not yet discovered by tourists today. Rent a scooter for just 3 USD a day and follow the main trans island road northward. Just before the end of the road, you will see a green steel ladder fixed to the steep cliff on your left. The ladder takes you to a satellite tower at the top of the rock. Note: you have to be somewhat adventurous, because it is not just a typical ladder. 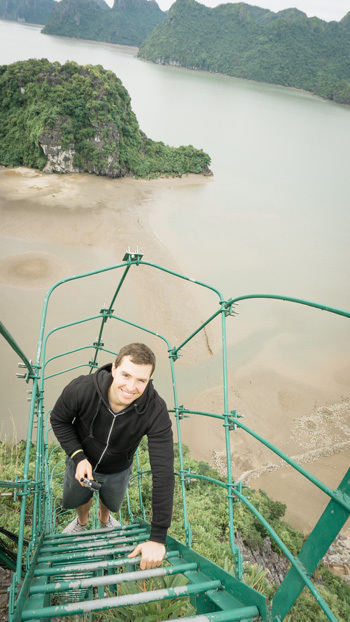 If you can control your fear of heights, you will enjoy a sublime and exclusive view of Ha Long Bay! Climb it! In fact, you can visit Cat Ba year-round. October and November are generally seen as the best travel months. We visited the island in December, which was also great. But do keep in mind that temperatures can drop to around 50°F. At those moments, a warm sweater and coat are certainly welcome. An advantage is that you avoid the crowds, which is a pleasure during excursions. It allows you to enjoy the beautiful nature, incredible views and interesting attractions more intensely! On the other hand, the center – Cat Ba Town – seems a bit lifeless in December. If you like crowded bars and restaurants, June to August might be a better option for you. This is high season for Cat Ba. You can leave your warm sweater at home, but in that period a raincoat is a must. The easiest and cheapest way to get to Cat Ba Town is a bus / boat / bus package which you can book from a local travel agency. This includes pick up at your hotel and drop off at the place of choice in Cat Ba, so you avoid taxi fares. In total, the trip takes about 3 to 4 hours of which, since the construction of the Tan Vu – Lach Huyen bridge, only 10 minutes by ferry. No time to get seasick! From Hanoi you can book this all-in ticket for about 10 USD per person. What is your absolute highlight in Vietnam? We like to hear from you! A trip to Mars? It’s possible!